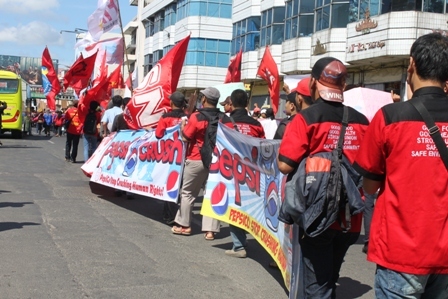 IUF affiliates in Indonesia joined the May Day march with the banners of the PepsiCo campaign launched by the IUF. 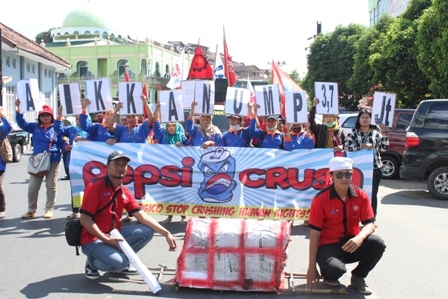 In addition to the May Day protest actions organized in Pakistan, Korea, and the Philippines against PepsiCo, workers in Indonesia called on PepsiCo to stop crushing a courageous group of workers in West Bengal India, who formed a trade union. Following the founding of their union, workers were harassed, assaulted by company goons and then 162 workers out of 170 employed in three warehouses were brutally fired.